I first heard about SCORE International through my childhood church. At the time, I was too young to travel with my church to the Dominican, so I was left to watch and wait until the day I could go myself. It was hard for me at the time, but little did I know how much that waiting would pay off in the near future. I first signed up to go to the Dominican Republic with SCORE in 2015, and everything changed the moment I stepped foot off the plane. I only went for a week, but just weeks after returning I applied to go back. I knew I was exactly within God’s plan for my life, and the following summer of 2016 I served as an intern for 4 weeks. And then, yet again, I served this past summer as a group intern for two and a half months. It’s crazy how God can work in ways you would never expect Him to, but I am so thankful for the ways He has used both SCORE and the country of the Dominican Republic to grow me, challenge me, and shape me into the person I am today. I think the way I want to structure this blog post is to share with you some takeaways, as well as the impact that SCORE has had on my life. To start off you may be asking, what does an intern do anyway? My main responsibility as a group intern was to build relationships with my teams. I acted as a cultural barrier between the clashing cultures of the Dominican and America, and I was able to serve the Dominican people through my role of serving my groups. How cool is that? I spent a summer building relationships with amazing people. One of the main areas that I have seen God grow me in is my confidence and trust in Him. I have found that it can sometimes be hard for me to trust in God’s plan for my life when I get caught up in the craziness of life and school. But when I look back at the past years of my life, I can’t help but be amazed at all that He has done in my life, and I can’t help but smile when I think of the future. Another area of my life that God has continued to bless me in through SCORE is my relationships. God has taken little pieces of my heart and left them all over. 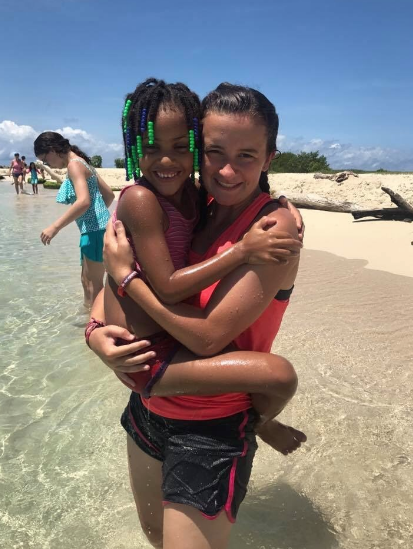 Whether it be in a sugar cane village, an orphanage full of children yelling, “gringa!”, or with one of my teams from the States, SCORE has given me the opportunity to meet so many amazing people. I absolutely loved getting to work with so many different missions teams throughout the summer, and having the opportunity to see what they are passionate about, and I also loved getting to connect with SCORE staff. My trips to the Dominican have also given me an amazing opportunity to develop and explore my love of languages. I have been learning Spanish for many years, and it is so cool to see the ways that my Spanish has flourished simply from interacting with the Dominican people. I absolutely love the way that God has given us the ability to interact and communicate with people all over the world. I am excited to see how God will continue to use my passion in this area of my life in the coming years! My appreciation for SCORE and all the memories I have thanks to SCORE would never fit in one blog post, but these past 3 summers have been absolutely incredible and more than I ever could have imagined. I have seen the impacts of my time in the Dominican have ripple effects into every area of my life. I am a better leader, I am braver, I am stronger, I am more confident, and I have a second earthly home in the Dominican, all because of SCORE. Hey! My name is MaryEllen Crawley, I am 20 years old and was born and raised in Buffalo, NY. I am currently a sophomore at Daemen College studying Spanish and Psychology. My hopes are to pursue a career in speech therapy or linguistics! I have traveled to the Dominican Republic with SCORE three times and God has revealed so much to me about His heart and what it is means to live your life on mission through those experiences.